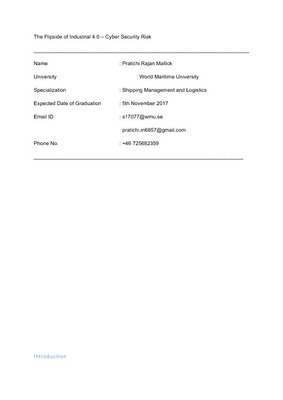 Prize-winning paper for the 2018 Bureau Internationale des Containers (BIC) essay contest. "With the increase in global trade, container traffic has increased tremendously in the last two decades. Global container movement has surpassed the 700 million mark (UNCTAD, 2018). This signals a definite milestone for the industry, but it poses a significant threat in terms of commercial viability, safety and security of container related operations. The past year has seen an increase in container related incidents onboard container vessels, ranging from fire, collisions and stability issues. From the complexity that arises thereafter, it is therefore imperative to look at how the container industry can be revolutionized, to enhance safety and security." Prize-winning paper for the 2017 Bureau Internationale des Containers (BIC) essay contest. 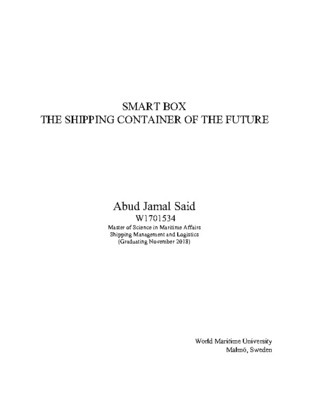 "Considering the magnified importance related to the proper use of containers, the description of the following ideas which are all applicable to the use of containers will provide with a theoretical road map for the progressive implementation of the intermodal transport digitalization." 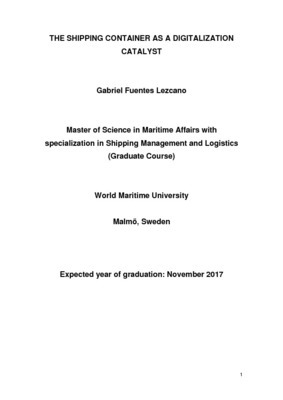 -Fuentez Lezcano, The shipping container as a digitalization catalyst. In the current scenario of market volatility and globalization, the shipping industry is under immense pressure in terms of growth, revenue expansion, trading condition and cost optimization. From the advent of steam powered vessels to the current fiasco of autonomous vessel, the industry has evolved albeit slowly to a data focused industry. The wave of data collection, sharing and utilization to optimize operations via automation is the next phase of industry revolution, Industry 4.0. The convergence of real and virtual worlds as a result of digitalization has been a crucial driver of change and innovation in the shipping sector. Data has been elemental in developing sustainable mobility and logistics helping companies like Maersk, securing a competitive position. The Age of industry 4.0, which is based on platformbased cooperation between liners, ports and logistic service providers and innovation based strategy incorporating weather and traffic data to optimize operation exposes companies to many challenges.